ESCOT-SEP Christophe has released their native Firemonkey mapping component for Delphi XE7 Firemonkey. TECNativeMap is a 100% Object Pascal offline caching mapping component for Firemonkey (we’ve covered it before for XE5 here). This means it does not rely on the native mapping components on your device or on TWebBrowser. The bonus to using this type of component is that you can run it without any internet access (which can be common on a mobile device). It runs on Android, IOS, Windows, and OSX which are all of the platforms that Firemonkey currently supports and probably also works with AppMethod. This is a commercial component set but there are ten different demos available including a FMX and Android demo. It supports mapping data from the following mapping services: OpenStreetMap maps, MapQuest, CloudMade, OpenCycleMap and OPNV plus Bing or your own custom tile server. It has another option where you can have a minimap in the corner of your larger map. If you’re doing any kind of mapping with Firemonkey you should check this one out. 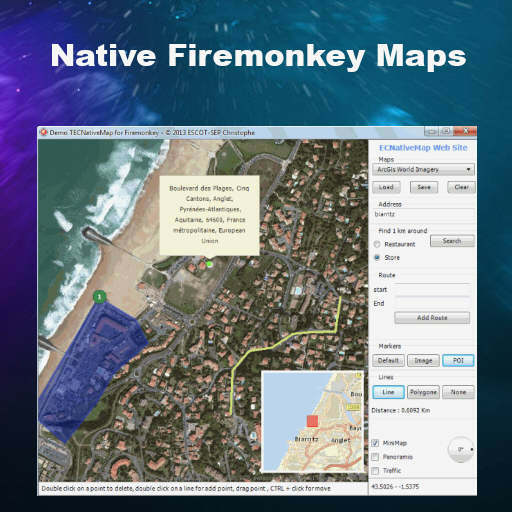 Head over and check out the demos of the native Firemonkey mapping component for Delphi XE7.